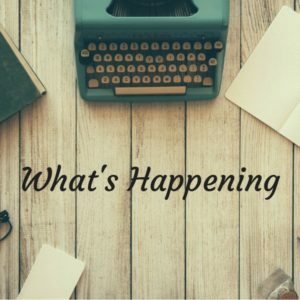 The second edition of my What’s Happening series, where you get a sneak peek into what I’ve been up too and what I’m loving when it comes to all things food, natural beauty and more! Well I really can’t believe another month has flown by! Throughout March I worked with a web developer who helped create the beautiful website you can all see now. I wish we took screenshots of what it looked like before to see just how far it has come! I really could not be happier with where it ended up! I also joined a new gym and have been going to some classes. Our old gym didn’t have classes so I’m excited to try all the different ones out! I must say I’m already a huge fan of barre – I even dragged one of my friends to a class on a Friday night! This past month also brought the very exciting birth of my beautiful niece Audrey. Our whole family is smitten and I absolutely love seeing new photos of her and am counting down the days until I get a cuddle! April looks to be an even busier month but I really want to try and focus on my health as much as possible. Easter is coming up and it can be all too easy for me to get into a holiday mindset where anything goes with food but I want to be more mindful about what I indulge in and I don’t. That doesn’t mean I’m not going to have an egg! It just means I’m not going to eat the whole bag! Now without further adieu, let’s break down the haps! Beef And Vegetable Stew – Adam requests this every week for his lunch now and I’m more than happy to oblige. Such a nourishing bowl of goodness and I love that it is packed with so many vegetables. No Bake Peanut Butter Oatmeal Protein Bites – I have made about 6 batches of these in the past month. Cannot. Get. Enough. If you haven’t tried them yet please do! They are an excellent snack and the best part is it feels like you are having a treat without overindulging in crap! Kale – I’ve been experimenting with kale in salads! Up until recently I’d only ever put Kale in a juice but those days are now gone. I ate a different kale salad every day last week and I actually really love the taste of it! I’ll be sure to post some recipes over the next few weeks for anyone who may have been as nervous as me to try it out! Essano Argan Oil Shampoo and Conditioner – I was recently looking around for a new shampoo and conditioner and stumbled across the Essano range at my local supermarket. I am absolutely obsessed. Their range doesn’t contain sulphates, parabens and a bunch of other nasties found in more common shampoos and conditioners. It leaves my hair feeling soft and smooth and adds moisture while protecting my colour. It also smells amazing and 24 hours after a wash my hair still smells beautiful and fresh. If you are keen to try more natural hair products but don’t know where to start, give this a try. Billions – The second season has been amazing – so many twists and turns in just one episode and the acting is brilliant. If you haven’t gotten around to watching the first season yet, give it a go! Sneaky Pete – I’m yet to meet a TV series brought out by Amazon that I haven’t enjoyed and Sneaky Pete was certainly no exception! Fantastic cast, great storyline and keeps you guessing until the very last minute. Definitely worth adding to your watch list. The Lego Batman Movie – This movie is so funny and clever!!! I absolutely loved the first lego movie and this one I think is even better. You don’t have to be a kid to enjoy it and in fact I think a lot would go over their heads! See if you can pick the voices which is always fun! Go watch it now! S Town podcast – This podcast is from the makers of Serial and This American Life, and as soon as I heard that I hurriedly binge listened to it over the weekend. If you enjoyed the first season of Serial, the documentary series Making a Murderer and enjoy twists and turns, S Town is for you. Green Light by Lorde – I only heard this song on the radio for the first time last week but when I got home downloaded it on iTunes straight away. So damn catchy and still unbelievable to me that someone so young has so much talent! Smarter Faster Better: The Secrets of Being Productive in Life by Charles Duhigg – I am am a huge fan of Charles’s book The Power of Habit and when I saw this one come up on my suggested list on Amazon I just had to give it a go. I’m currently halfway through and I’m hooked. His books always relate theory to real life case studies which makes for fascinating reading. I wholeheartedly recommend The Power of Habit for anyone who is struggling to make a change and Smarter Faster Better for anyone who is interested in improving their productivity. Believe me – it is refreshing to realise you aren’t alone in the struggle and to hear what others have overcome! On Tyranny: Twenty Lessons from the Twentieth Century by Timothy D. Snyder – One show we watch religiously is Real Time with Bill Maher and last week he had Timothy D. Snyder on the show talking about this book and relating it to what is going on in politics currently. I’m really excited to give it a read and will let you guys know my thoughts once I’m finished! Brand new series – Cassie’s Challenges! Stay tuned! HAVE A HAPPY AND HEALTHY APRIL EVERYONE! I listened to S Town following your recommendation. It is brilliant… I don’t dare go to Serial until the next holidays as I binge too much. I really do need to read that habit book! The Power of Habit is amazing! And S Town was wonderful too! Glad you liked it!